Wow, what a weekend! I didn’t even know the Grand Prix was on (or how big it was!) 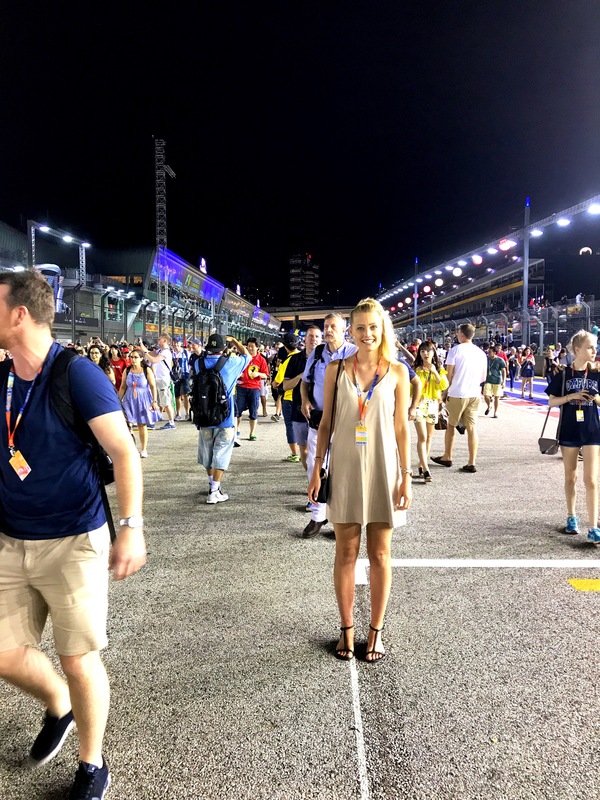 until I got to Singapore and saw that some of the roads were shut for it, and I ended up with an invite all 3 days in the pit grandstand and had the most amazing few days! 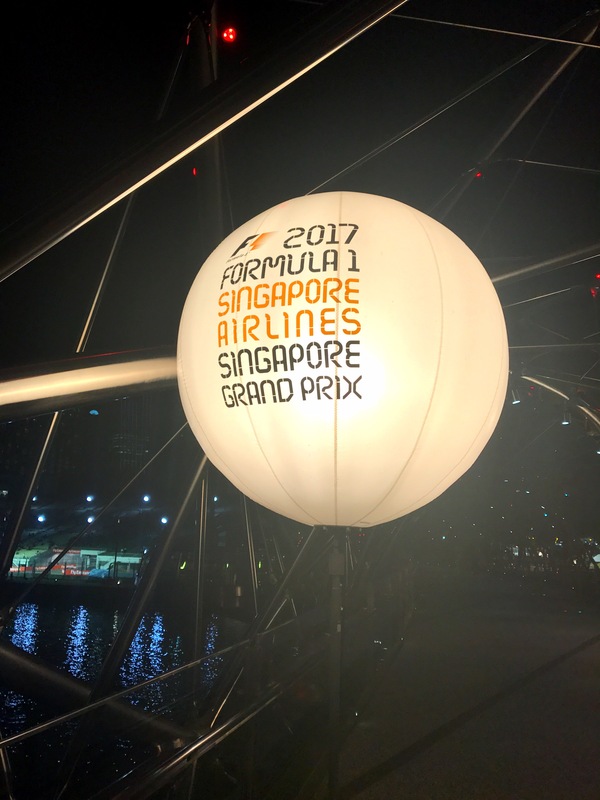 On my first night in Singapore I was at the SkyBar at Marina Bay and got talking to some people who were there for the Grand Prix, and before I know it they’re inviting me along to go with them as they had a spare ticket. 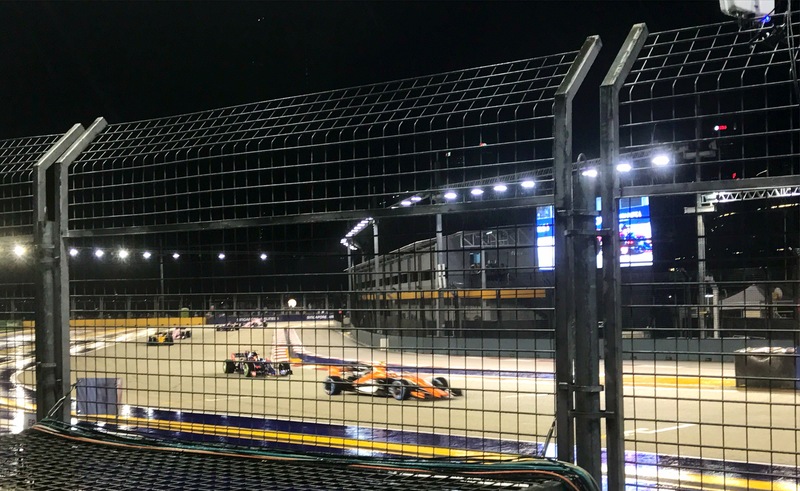 And it wasn’t just any spare ticket…it was a spare 3 day ticket with access to all areas of the track and a seat right opposite pits/starting grid, costing well over $2000…I still can’t believe how lucky I was! The group I spent the weekend with at the Grand Prix were honestly some of the most lovely people I’ve met and they really did make my time in Singapore so special. On the Friday we all met at The Fullerton Hotel for drinks before heading over to explore the track and find our seats to watch the practice. Saturday was the qualifiers. 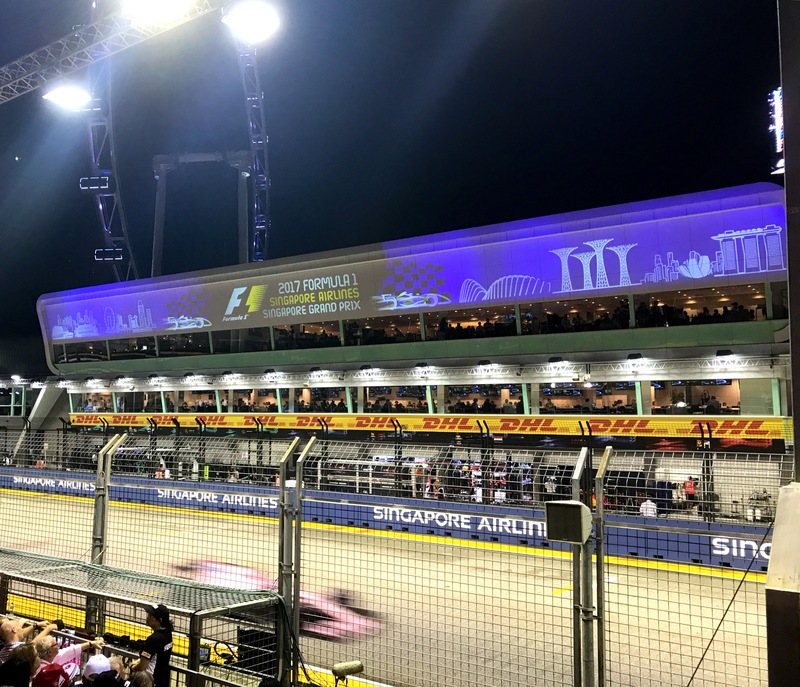 We met for a delicious dinner at db Bistro & Oyster Bar at Marina Bay, and then enjoyed cocktails and late night snacks whilst watching the cars. The big race was Sunday, and we started off with a delicious steak at Wolfgang Puck’s CUT at Marina Bay. By this time I’d really gotten into it and it was so exciting! The atmosphere was just amazing. 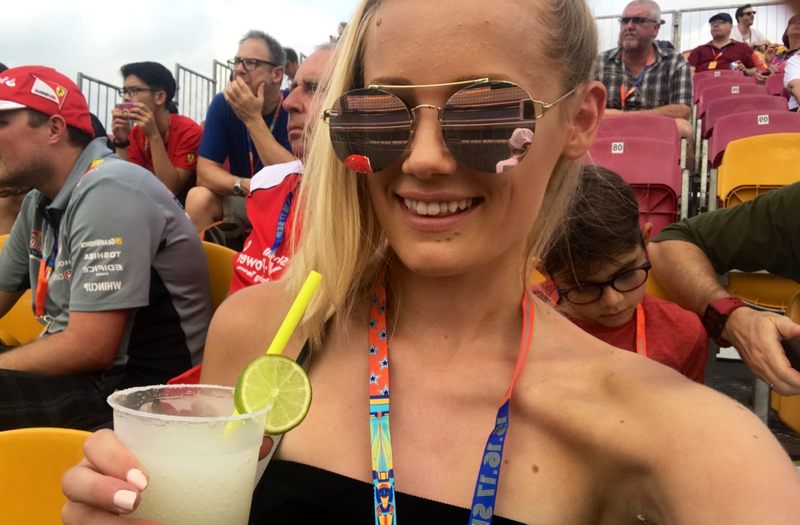 Who’d have thought I would come out of Singapore a huge F1 fan?! 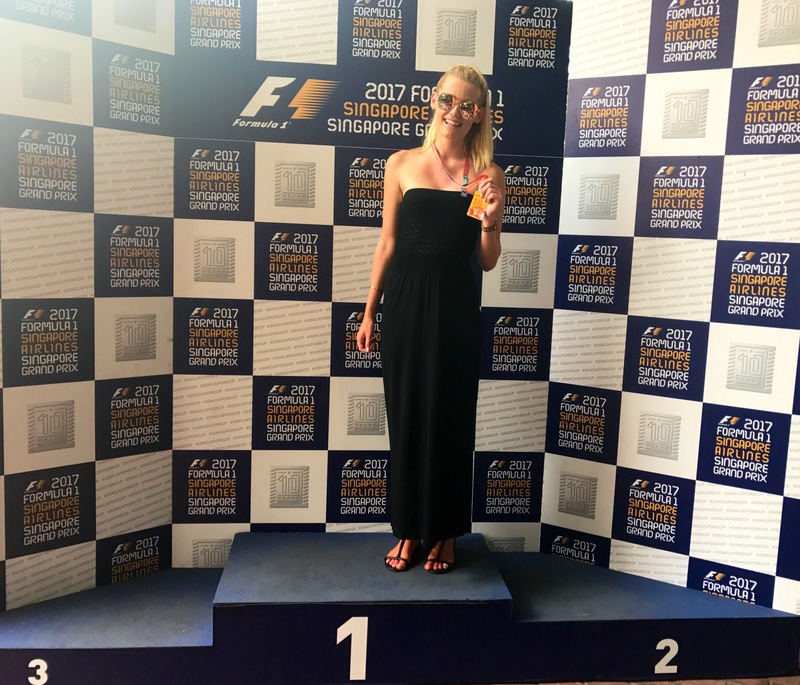 We even got to watch the presentation afterwards from the track so I could get a front row seat of cheering the winner Lewis Hamilton much to the disgruntlement of my Aussie friends who weren’t too happy that a Brit had beat their Australian Daniel Ricciardo. I still can’t believe how lucky I was and how amazing that weekend was. I can’t thank my new Aussie friends enough for looking after me and for all the fun we had! Nicely finished off with cocktails in the SkyBar at Marina Bay Sands.